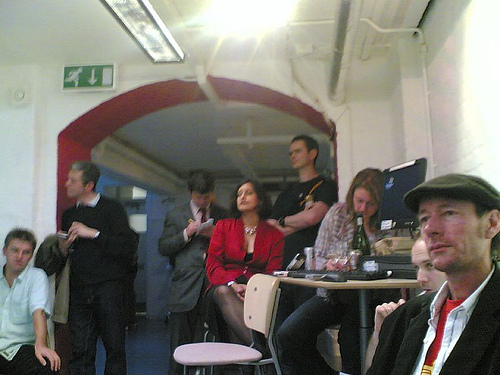 Thats me at the WeMedia Fringe in my red Creative Commonist t-shirt. The MC asked if anybody was communist but I didnt let on. Nice photo – thanks Mike. 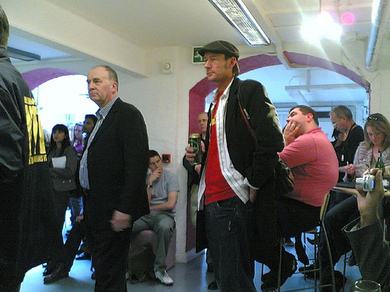 WeMedia Fringe was an enjoyable series of talks and chat in Soho, London. It was everything it was supposed to be and, apparently, everything that the WeMedia Global Forum wasn’t. I wouldn’t know. I didnt make it to the Forum nor could I afford the entry fee, although i could have applied for a scholarship or gatecrashed it if i was really serious about going. Which i wasnt – i was just in London for the day and am already at Lake Constance, Switzerland, where I am now finally [sorry for my tardiness] getting this blog post up. Video will take longer. Lots of official media suits and BBC people. I think BBC is that old TV station i used to watch as a child with the picture of a river and city coming after each show. Good to see TV folk who know the new media scene and also bloggers who stay connected with the broadcast world. Highlight for me was meeting other bloggers, some more egotistical than I, others who had been blogging as long as me – and even one who had started 6 months before me – Regular Jen who started like i did in the late nineties on a geocities site. Great to have a beer and a chat with interesting people – Tim of bloggerheads is an Aussie blog vandal and politcal stirrer who sees the English political scene as his playground and Google his spray can. He has an initmate knowldge of the ways of Google and shared those secrets with us. Hint: Fresh content is a good way to keep your links and therefore google favour. The creator of NowPublic.com was showing off his site – really nice guy and a great web site. Another place to store my video for free. Oh yeah . . . Chris Yapp from Microsoft gave a spectacular speech which is gradually being uploaded by someone to NowPublic for your viewing pleasure. Stayed out late with Alan (MC from BBC) and Kevin and Robin Hamman who turned out to be a thoughtful American from Preoria. More thoughts and images when i get back to my computer at home. Nope that would have been Thames TV one of the Independent TV companies i.e. ITV. I’m pretty sure it’s “Peoria.” I like the old school hat you’re rockin’, though. sounds like it was a fun time. say hi to life in “the west” for me. Stylish Skinny, for sure. Do you take a photographer with you on these events…just kidding. Cool photos. I just found your blog …. It’s excellent! Well written. Great subject. You have another reader!